Ensuring that your bones and cartilage stay healthy is extremely important for anyone embarking on a serious training regime. 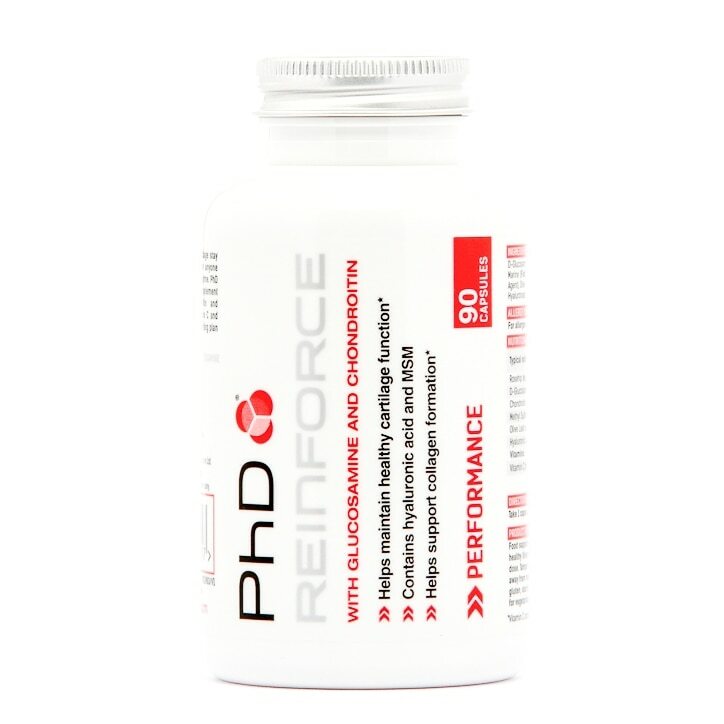 PhD Nutrition Reinforce helps to maintain healthy cartilage function and collagen formation. 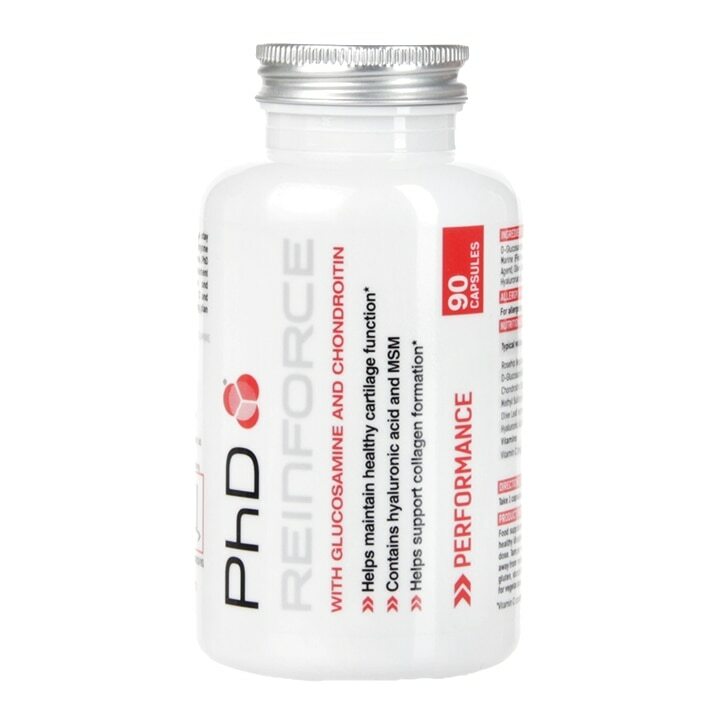 PhD Reinforce joint health supplement contains glucosamine, chondroitin and hyaluronic acid, along with Vitamin C and MSM to supplement an intense training plan and active lifestyle. D-Glucosamine Sulphate (Crustaceans or Crustaceans Derivatives), Chondroitin Sulphate Marine (Fish and Molluscs Derivatives), Methyl Sulfonyl Methane, Maltodextrin (Bulking Agent), Olive Leaf Extract, Rosehip Extract 20:1, Vitamin C (Ascorbic Acid), Sodium Hyaluronate (Hyaluronic Acid) (Soya), White Gelatine Capsule (Gelatine, Titanium Dioxide). Food supplements should not be used as a substitute for a varied and balanced diet and healthy lifestyle. Store out of reach of children. Do not exceed the recommended daily dose. Tamper resistant. Do not use if inner seal cap is broken. Store in a cool dry place away from moisture and direct sunlight. 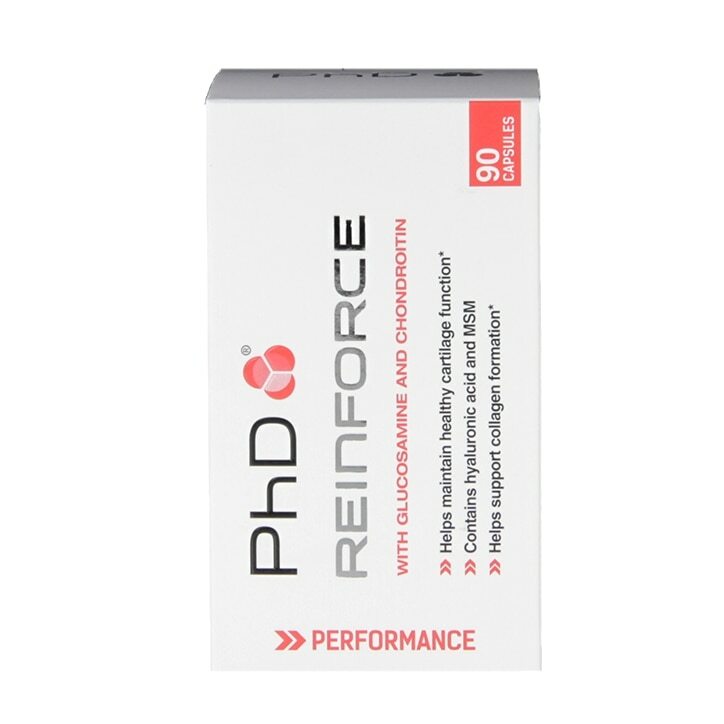 PhD Reinforce Capsules is rated 5.0 out of 5 by 2.